I sure have been neglecting the blog lately. After the accident my back and neck have sure been bothering more than I thought they would. I've been going to physio so hopefully things will improve soon. Not to mention a certain someone is keeping me up at all hours. We have been renting apartments for over 5 years now. It sure would have been nice if we would have bought 3 or 4 years ago when we were thinking about it, but what can you do! There are some really good things about renting an apartment and some really bad. -it is soooooo hot in our apartment and there is only so much I can do about it. I could easily come up with many more BAD things, but there is an end in sight with this apartment living so I'm getting over it. Now I have a story about why I do kinda like our apartment right now. I'm gonna go all over the place with this. I went out on Saturday for a Girlie Night. I came home to the most wonderful surprise. The stunt James has been pulling lately (as in for the past month!) is to be awake for an hour or 2 in the middle of the night. Sometimes he's content and babbling away, other times he's just fussy and whining the whole time and occasionaly he is GRUMPY! We have had him in our room the whole time and even if he's happy it's hard to really sleep through his jib jab. Like I said, I hate apartments, I'm so sick of them, but as far as apartments, we have a good one on some levels as mentioned above. We have not one, not two, but THREE storage rooms, and a nice size bathroom closet. So back to my story. I came home to find the storage room right beside our room ALL CLEANED OUT with room for James' bed and a chair too! We have been trying to find the time and energy to do if for a month or two now, but Derek has been soooo busy we haven't had a spare moment. And I wasn't about to take on this task myself with the large items that had to be moved. Also, I was sooooo excited I let Derek have an extra soda. It really isn't that great for the night yet. It only means now I have to get out of bed and walk instead of roll over and put in his soother, but I'm still happy abut it. Now we have some room to breathe in our bedroom with that playpen out of there (yes, James sleeps in a playpen because I really don't want Alli out of her crib yet and have to do some disipling to keep her there) and we can actually talk in bed instead whisper for fear of waking the beast! So I am very happy about that. I'm so very excited right now because I am going to pick up my friend Melissa in a few hours! We were the BEST childhood friends. We met somewhere around the monkey bars in grade 1 and were inseperable for years. The first thing I think of when I think of us as kids is BARBIES! We were CRAZY about barbies and played them day in and day out untill our legs were asleep and cemented into the kneeling position. She moved to Las Veags after grade 7, and we slowly lost touch. But have been in really great touch (as far as email, blogs and facebook go) for the past couple years. So we are just going to pick up where we left off 12 years ago. I'm so excited for this weekend! Ok so I just wrote A LOT! hope you enjoyed it ALL! Here's a few pictures of this and that. Give him a second of your attention and he's smiling. Here's the craft we made with the stuff alli gathered on her walk in the river valley with grandma forever ago. She wasn't into having her picture taken, so I jusy propped it up! 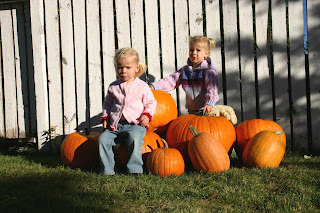 Alli and Lucy with all the pumkins grandpa grew in his garden. He torments her already. Did i mention he is trying to crawl and sit up these days? This kid has got to learn how to relax. This picture looks like James almost has some hair, but he really doesn't have much. He could really use some to hide that ridge in his head! I know what you mean about haveing your room back. We moved TJ into his room a while ago and it is SO nice! Just be glad all James is trying to do is crawl and sit up. TJ has been crawling for over a month now and just started pulling himself into standing and walking around whatever hes holding on to this past week!! I can't move fast enough to keep up with the monkey!! Love the storage room bedroom. We put Roman in there in a playpen when my family was up to visit once and needed to sleep in his room. Have fun with Melissa! Hopefully only a few more months of apartment living. Don't feel bad about the playpen, Melia is still sleeping in her playpen in the toy room because I keep thinking it is just about time to move so I have never set up her crib. Yay! I had so much fun this weekend! I love the picture of my boyfriend, James. He looks so cute!! It's really too bad we didn't get to play Barbies this weekend like old times. Oh, memory lane. Seriously though, "cemented" is the perfect description! I'm a stay at home mom to my 3 exceptionally fantastic kids and married to my ridiculously good looking husband of almost 10 years. No complaints! Long ago I decided that a little bit of chocolate everyday is not only ok, it is a very good thing. "Twenty five years from now, you will be more disappointed by the things you didn't do, than by the ones you did do. So throw off the bowlines, sail away from the safe harbor, catch the trade winds in your sails. Explore, Dream, Discover." Mom! It's a little Taaaail! Well it has been awhile.